A rare treat!! Li Gui Chang’s senior disciple, Chen Quan Gong, leads an in-depth discussion of Xing Yi Quan theory and training. Master Chen talks freely and openly about how to train Xing Yi correctly and the subtle changes that take place in the body during the practice of San Ti Shi and the Five Fists. Originally posted online in Chinese, this English translation is offered by Huang Guo Qi, Tom Bisio and Martin LaPlatney. 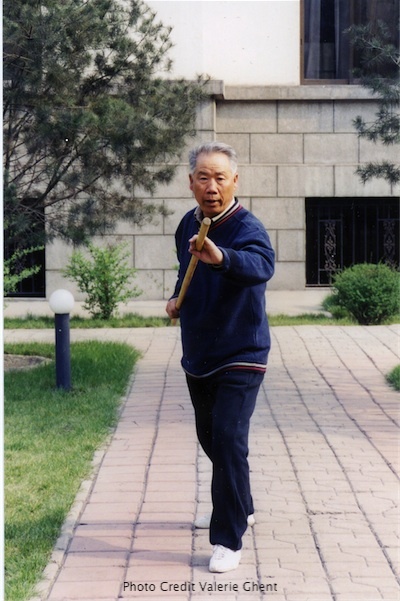 Chen Quan Gong demostrating the whipstick form in 2001. On April 10th, School Uncle, Chen Quan Gong, was invited by the association to give a lecture. As soon as School Uncle got out of the car, he gave me his written manuscript: “In Memory of Late Master Li Gui Chang”. School Uncle Chen is one of the oldest disciples who followed Master Li for a long time and has trained the internal arts for over 50 years. Although School Uncle is over seventy years old, he is still strong and robust, has a cheerful disposition. His expression is open and clear and he does not style himself a senior master. In shooting the Pushing Hands CD recently, he trained continuously for over one hour, and still looked hale and hearty, vigorous and nimble in his movements, firm and forceful in his strength and free in his applications, vividly confirming the life-preservation (yang sheng) effect of training in the internal arts. The meeting was hosted by Chi Shao Bin. School Uncle Chen lectured to members of the association on the topic of Xing Yi Quan. First, School Uncle Cheng asked: “Do you know what Xing Yi Quan is? Who can give me an answer? School Uncle Chen: “Right. But, five elements, twelve forms, single training and technique training train the skill and practical framework of boxing. This framework is superficial; it is only the skin and hair. The root and foundation emerge in the gong fu. Only when one has the gong fu, can the body be strong and healthy and the movements have a foundation. Otherwise it is simply an empty facade. Therefore, Master Li said: Nowadays in learning the martial arts, more attention is spent in training tricks and techniques and little on gong fu. Those who learn the boxing framework are students, and those learn the gong fu are disciples. Then, why is there a difference between the students and disciples? In fact, this is the difference between entering the door  or not entering the door. Therefore, disciples are apprentices who enter the room, and the students are laymen. So, in learning the internal martial arts, the energy and attention should be principally focused on the gong fu. Now how does one train the gong fu?